Hotel reservations at the 2019 NGRC discount rate are now available. Please click here to go to the DoubleTree by Hilton Portland web site to reserve a room. If you prefer to make a reservation over the phone, please call 503-281-6111 during normal business hours or call their central reservations team 24/7 at 1-800-996-0510. When speaking with a reservation agent, please reference the group code LNY to receive the discount rates. 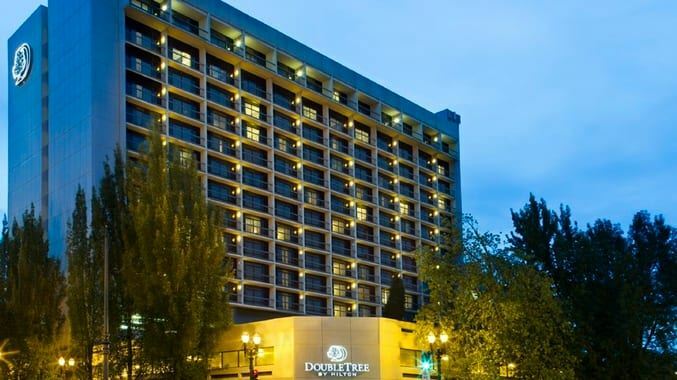 Begin your stay at the newly renovated DoubleTree by Hilton Hotel Portland, located at 1000 NE Multnomah Street, Portland, Oregon 97232, with a warm welcome and a delicious freshly baked cookie upon arrival. Conveniently located in the Lloyd District on the west side of the Hollady Park, which has the Lloyd Center shopping mall on its north side, and Portland MAX light rail on the south side. The rooms offer delightful views of either downtown or the beautiful Cascade Mountain Range, and modern amenities. All of the 2019 National Garden Railway Convention (NGRC) clinics will be held in the various conference rooms of the hotel. The Registration desk where you can get your convention bag with various items including tickets for the various events, get information on the convention and the surrounding area, and post messages on the NGRC bulletin board. The NGRC store to get those cool collectible items, such as T-shirts, hats, pins, and pick up the Convention Car. The Vendor Hall will be just on the south side of the main lobby area, across the covered entrance for vehicle passenger drop-off/pick-up. Be sure to visit this often, to pick up those fantastic deals on railroading equipment. Stay active with a work out in the fitness center with a range of modern equipment. Rejuvenate with a relaxing swim in the outdoor pool. Enjoy a great meal that utilizes fresh, local, and organic ingredients, at one of the hotel's restaurants or lounge. Hop on the Portland Max to explore the exciting city of Portland. Enjoy a relaxing afternoon or evening in the Holladay Park, just across the street from the main entrance. Browse through Oregon’s largest shopping mall, the Lloyd Center Mall, located on the north side of Holladay Park.